Hi there, I'm pretty new here and haven't done any racing yet. I'm thinking a lot about race timing etc. 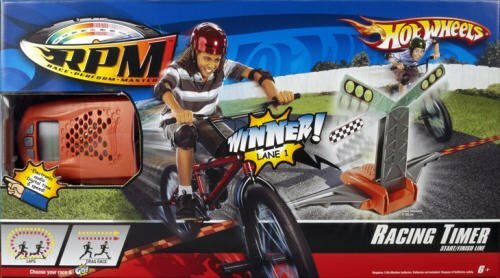 Has anyone tried to mod the Hot Wheels RPM Race Timer that was built for running and bikes to use for 1:64 cars? I need a way for the cares to trip the timer. So this is like a sensor for "real size" things and it just flips on a light based on who breaks the beam first? Never seen that item before but if that's really all it is, then I'm certain it can be "hacked" to work for racing...and now someone here will try. If you get around to trying, please share your discoveries. Could be a good alternate finish line. There are no complicated light beams or anything. You run or ride over a plastic bar that turns a knob on the unit. Now that I've opened it up I have figured out how to make it work. It's a very simple switch that stops the timer and shows a false start in lap mode. Here are some before pictures, I'll post after pics an video when complete. This will work great as a 2 lane timer, Hot Wheels should produce this. I paid $13 cdn. I'm just going to add switches that are wired to the unit on the start gate and at the finish. If you have any suggestions please post. I get it now...simple mechanics with some extra electronics, typical Mattel...but all the better for hacking and modding. I'm no EE but looks simple enough that you could pull out the guts and put it in a different case for a diecast finish. What does the LCD show? Time difference...what does it claim to measure? BTW, nice photos and annotations...very clear to understand. It will show who won and both times. I picked up 2 more for 6 lane racing, I'll just have to enter the times. I'll upload a video shortly. Still looking for ideas for the best finish gate possible. Hanging paddle like Max Traxx? For mechanical triggers, I think the dangling wire paddle that is on the Drag Track is nice. It swings very loose and is very easy to move, so I feel it would be more accurate. Plus it would put less strain on the cars too.